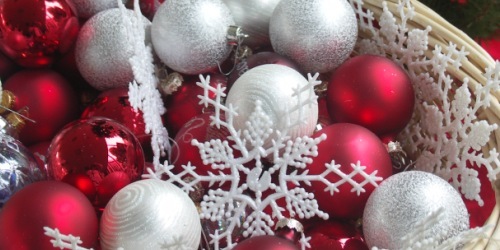 Greetings in the name of our Savior born for us—the Messiah, our Lord! On behalf of our worldwide staff, volunteers, and the Mission and Ministry Board, I want to express our gratitude for the many ways you faithfully strive to live out the gospel—to simply try to do what Jesus did. The vital ministries of Church of the Brethren members and congregations, small and large, are at the heart of our denomination. 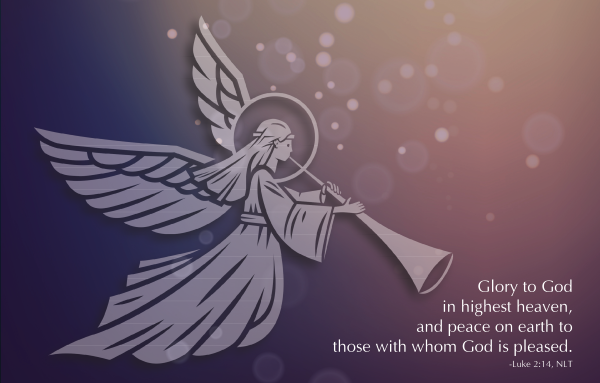 Your witness is essential in our partnership as we together herald the Good News of the birth of Jesus Christ. As we close the year, we celebrate that our Brethren witness is meaningfully extended into new places and in new ways. The Church of the Brethren is seeking to become a Global Church of the Brethren. Our growth around the world and our commitment to deeper and more meaningful relationships are helping this vision become a reality as we enter 2019. In August, Josiah and Christine Ludwick and their children began a year of service in Rwanda to preach, teach, and demonstrate a Brethren way of living. Their appointment is vital to the efforts of establishing a peace testimony in the Great Lakes region of Africa as they host theological education and training, assist in the construction of church buildings, and deepen relationships. In Venezuela, the Brethren witness is growing but economic turmoil has prevented the placement of mission staff at this time. Global Mission and Service staff and volunteers travel there when possible and work with Venezuelan leadership to broaden the understanding of our church’s theology and practice. Brethren in Spain continue to add new congregations and expand their membership. Many are immigrants, but Spanish citizens are beginning to take notice and come to services. Haitian Brethren have proved themselves faithful again this year by reaching out to the suffering when an earthquake struck in the north of the country. In Nigeria, Global Mission executive Jay Wittmeyer was present at the commissioning of a new EYN congregation at the Gurku Interfaith Camp for displaced people. The Nigerian Brethren also commissioned their newest church district in Lagos, with EYN now numbering 55 districts. The Nigeria Crisis Response continues to bring healing and hope to thousands of families displaced by violence. Embracing Jesus’ call to go and make disciples has been at the heart of our ministries throughout this year. Youth and advisors gathered at National Youth Conference to be challenged in their walk of faith. Church planters and others gathered at the New and Renew Conference for professional development and encouragement for the work of nurturing new disciples. The Discipleship Ministries team provided resource leadership at congregational and district events, web-based learning opportunities, and collaboration with Bethany Seminary for an Urban Ministry intensive in Atlanta. For Brethren Disaster Ministries, loss of Paradise Church of the Brethren and most of the congregation’s homes ended an intense year of responding to disasters—including a rebuilding project in North Carolina that closed during Hurricane Florence but quickly reopened to help people affected by Hurricane Matthew. In Puerto Rico, our disaster response expanded into the mountains around Castañer, where a long-term home rebuilding project will continue through next year. Children’s Disaster Services supported families affected by floods, hurricanes, volcanoes, shootings, and the Camp Fire that burned Paradise. Together, we have shared hope and God’s love. God has enabled us to extend Christ’s mission, serving those in need both near and far, growing disciples, calling and developing leaders, and transforming communities. Thank you for your partnership, your generous support, and your prayers. May we together continue the work of Jesus. “Therefore, as God’s chosen people, holy and dearly loved, clothe yourselves with compassion, kindness, humility, gentleness, and patience. Bear with each other and forgive one another if any of you has a grievance against someone. Forgive as the Lord forgave you. And over all these virtues put on love, which binds them all together in perfect unity” (Colossians 3:12-14, NIV). National Youth Conference, which started in 1954, is one of the largest gatherings of Brethren in the United States. 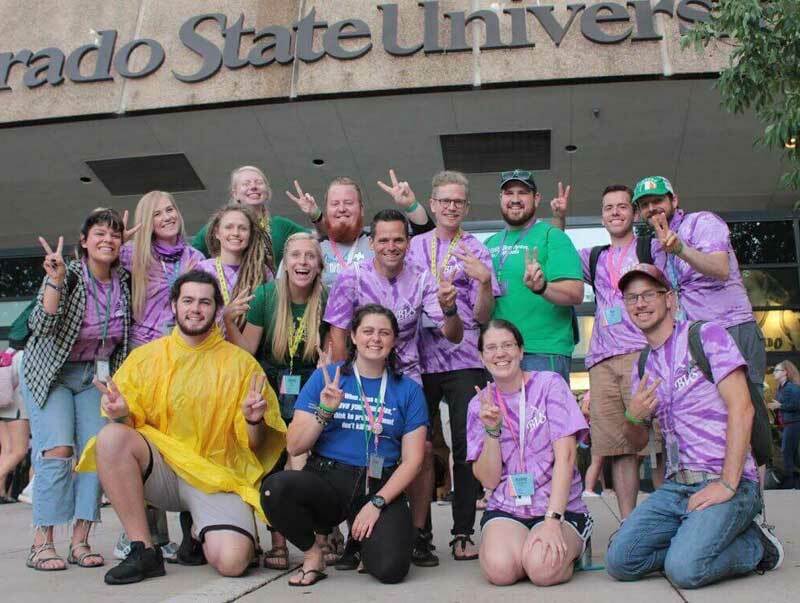 It brings youth and advisors from across the country, and some from other countries, to Fort Collins, Colo., for a week-long experience unlike anything else. Each day there is worship, small groups, service projects, hiking, recreation, free time, and so much more. As like-minded Christians and loving Brethren, we come together to deepen our faith, ask meaningful questions, and walk with one another as Christ is present in the midst of this inspirational, faith-forming week. The National Youth Cabinet chose the theme of “Bound Together: Clothed in Christ” with the idea that we as Christians need to be unified in times of division. In our everyday, ordinary lives we need to wear compassion, kindness, humility, gentleness, and patience for others like we wear our clothes. These are the ideals and characteristics that should bind us together to be united with our brothers and sisters—not only within our local communities, congregations, and daily lives, but in our global communities as well. 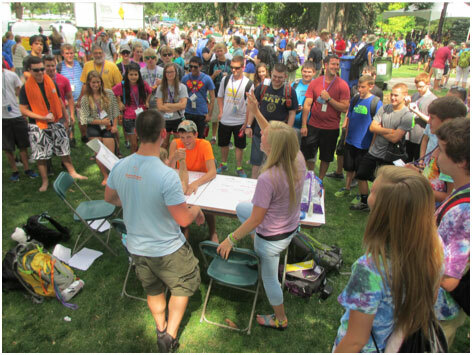 This summer at NYC we are excited to hold service projects on the campus of Colorado State University. This will create a space for youth to really learn about the place where they serve and to more intentionally understand why we as a denomination hold service as so valuable. During our offering time, we will collect items for clean-up buckets for Brethren Disaster Ministries that will later be organized and packed as one of three service projects. This project is one sample of how we are bound in community with our brothers and sisters who have been affected by natural disasters, and it is our hope that youth will see this first-hand as they pack the buckets. We invite churches that don’t have youth attending NYC but would like to support these projects, to send supplies for the buckets to the General Offices (1451 Dundee Ave. Elgin, IL 60120) and we will take them to NYC. Brethren Disaster Ministries is generously helping to supply the buckets, detergent, and cleaner to make travel to CSU for youth a little lighter. As excitement for NYC continually builds, we can see God constantly working in all aspects of the planning for the conference, and trust that God will work in those who attend this mountain-top event. We can’t wait to see how youth will explore what it means to be “Bound Together: Clothed in Christ” and the ways this theme is woven into their lives. Registration for National Youth Conference opens tomorrow evening (Thursday, Jan. 18). Learn more about NYC 2018 or register at www.brethren.org/nyc . National Youth Conference 2014. Ever since we were called by Christ to join the Y P double T this summer and blessed for our journey together, we had been anticipating the mountaintop whirlwind that is NYC. Not only would we get to experience the powerful worship services that we had remembered so fondly from NYC 2010, but we would get to share our message of radical peace with a larger-than-usual audience and check back in with youth we had met in our travels throughout the summer. Our responsibilities at this Spirit-filled conference were far and wide, so I’d like to run you through our typical day and throw in some heartwarming highlights. My teammates will share their favorite moments as well, along with highlights from some of our bigger events of the week. I arose bright and early each day for a breakfast meeting with all of the wonderful folks of On Earth Peace. We checked in about the day’s tasks and how previous events had gone. From there, we headed to Moby Arena to put on different displays and demonstrations for youth and advisors to view and participate in on their way into worship. This was one of my favorite responsibilities of the week. I got to hold a sign for the Stop Recruiting Kids campaign, which I delivered a speech about in my public speaking class last semester. I got to witness youth writing heartbreaking but very real things that keep them from claiming their identity, from fear to a mom with cancer. It is moments like these that remind me that we are all in this struggle of humanity together, regardless of age or background. We then entered worship, where Christy and I often joined forces with YPTT alumni and friends to dance our way through the theme song. We soaked in the skits, scriptures, and sermons alongside the youth, carefully noting what stirred our hearts so that we could lead good discussion with our small groups after worship. In one of the rare moments that all members of our team were split up to provide leadership, we all had slightly different approaches to small group time. We would exchange stories about how our respective youth were interactive, honest, and brave, which was always encouraging. After lunch, we led workshops. Alternating between a general introduction to YPTT and leading games with a peace twist, it was a blast to share our message with a more intimate, interested crowd, learn new dance moves, and ultimately get excited about meeting the next generation of peacemakers. The evening led into helping once more with displays and activities outside of worship, and then experiencing the power of music and dynamic speakers. After worship came late night activities, where we either attended concerts, caught up with our youth worker friends, or went to bed for some much needed rest. It is impossible to record all the life-giving moments that comprised NYC, but we came away from this time so grateful for the many lives that intersected ours. Perhaps above all, we are encouraged by the hordes of youth that we have to join us in the work of bringing heaven to earth. 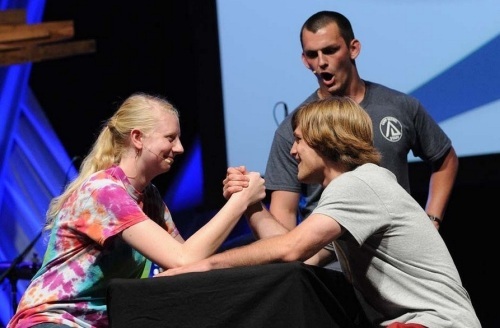 Arm wrestling Alexander Mack at National Youth Conference 2014. This summer we have run into the same people numerous times at varying places. From camps to Annual Conference to Song and Story Fest to NYC, multiple faces showed up again and again. Some of my favorite faces to see at these places were those that belonged to the band Mutual Kumquat. This Brethren soul-folk-pop band who plays songs focusing on social change and fun is a joy to listen to as well as hang out with. I’ve gotten to know each bandmate, especially since my brother Jacob Crouse had the opportunity to play with them this summer! Furthermore, in a late-night convo between some YPTTers and Kumquatians, we came up with the idea to collaborate on a song for NYC during their concert. Thus, we did so! Combining the wrap-up raps for a few of our peace sessions with a catchy hook & chorus by the band, we came up with a peace melody that we performed for the NYC body. I had a blast feeling like a rock star, performing with some of the coolest human beings I know, and spreading a message that I’m ridiculously passionate about. Pass the peace, pass the peace please! Pass the peace, yeah, pass the peace please! One of the many tasks we were given for NYC this year was to come up with a booth for the Brethren Block Party, carnival games sponsored by various organizations for the attendees to have fun partaking in. Having our only parameters be making an easily portable and cheap game was, at first, a pretty difficult task. The only idea that really came up was arm wrestling, but we still wanted something better. After weeks of failing to come up with anything new we settled on “Wrestling With Peace” as a title for our arm wrestling booth. We had hoped for moderate success and for a chance to talk to youth about the things in their lives that cause conflict. What we got was way more than we expected! Not 15 minutes into the block party we found ourselves surrounded by a crowd of youth watching Chris tear through challengers left and right. With color commentary provided by any YPTTers not currently arm wrestling, the crowd continued to grow and cheer for challengers and YPTTers alike. By the end of the block party, the booth had evolved from just us versus them to youth asking to use the table to challenge their friends too. Building community and getting to know the struggles in these youths lives was so much more fun and rewarding than I had imagined. Each member of the Youth Peace Travel Team was given a small group to lead. My group was Small Group #117 (SHOUTOUT!!!). The entire team missed the introductory lesson as to how one should conduct small groups and so we were left to our own creative energy. The time allotted were four different 45 minute sessions. Somehow in a combined three hours spent together we were to meet and form a bond, reflect and grow together, and leave better than we came. How one individual could manage all of this with 12-14 other individuals baffled me, but I gave it my best effort. Get to know you games were a must, as names are not so easily remembered when you are meeting one hundred new people a day. This was followed by some feeling out of the group as far as how they wanted to go about talking. My group decided they did not enjoy large group discussion, so I had to work without one of the easiest activities to lead. But we managed to get to know each other, check. The next day we did some team building and then got into concentric circles so that individuals were paired up and could share their experience in more intimate manner. The group seemed to enjoy it and the room was buzzing with conversation. I asked them what they wanted to change about the small group and to my surprise very little was suggested, and they enjoyed the concentric circles. So I challenged them that the next day we would be sharing stories about a lesson we learned in our lives. The next day I opened with my own talk and a speech about how this is a safe space. Everyone shared and went deep into their own lives about very serious issues that each of them were facing. I was touched that they all trusted each other. Bonding reflecting and growing together, check. The next day we did an activity I have talked about in the Camp Colorado Blog, Taps. The game correctly expressed the feelings of the group. We all appreciated how far we had come in the four days we had together and we were all going home changed, but blessed for the journey together. It was a wonderful experience to lead a small group and I truly appreciate the youth that are willing to put themselves out their to learn more about themselves. member Chris Bache at National Youth Conference . By Shelley West, member of the 2014 Youth Peace Travel Team. This is a phrase that frequented my introduction of the Youth Peace Travel Team and our work when we faced campers for the first time on jittery Sunday evenings. While our goal was to introduce the five specific perspectives of peace that we would be teaching throughout the week, it was a genuine reminder to ourselves of the variety of unexpected ways that peace showed its face to us all summer long. Peace was found in the group’s acceptance of my exceptionally poor performance during a camp-wide kickball game at Camp Colorado. 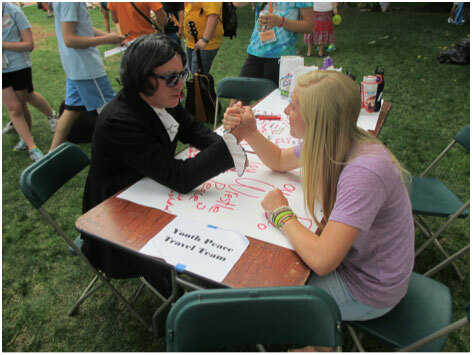 Peace was found in the inclusive and enthusiastic clamor surrounding our “Arm Wrestling for Peace” booth at National Youth Conference’s Brethren Block Party. Peace was found as our team struggled up the metaphorical mountain together, but made it to the top and gazed out at the spectacular view. Peace is found in whatever moment you decide to seek and pursue it. Jesus’ example of peace was radical, but versatile and all-embracing. We, too, are called to this job of uninhibited love-spreading. In each encounter with our siblings in Christ, we have a grand opportunity to look into their eyes, listen to their musings, and verbally affirm that our hearts are open to the sharing of this human experience. Whether with strangers in the neighborhood or parents we’ve never truly gotten to know, this interaction brings a smile to our God’s face and a spark of hope to those who we have stepped outside of our comfort zones to engage. Let us be active and willing in our approaches to peacemaking—at camp, at home, and around the world. In remembering our global brothers and sisters through fervent prayer, may we be simultaneously empowered to search for peace in our daily lives. May our hearts burn ablaze with a passion to search, to work, to love. Amen. September 21 is International Day of Peace. It is also the suggested date for the Mission Offering—an opportunity for congregations to support Church of the Brethren partnerships that maintain a peaceful presence all over the world. Visit brethren.org/missionoffering to find out more, and brethren.org/give to support all of these ministries today. Jarrod McKenna blesses Dunker Punks at National Youth Conference. Sitting on the stadium floor next to my friend Aaron before worship on Wednesday night, I was afraid that National Youth Conference might pass me by with only a gigantic pillow to show for it. I’d always heard that NYC was a life-changing experience, but so far I hadn’t really felt changed. Enter: Worship on Wednesday night. I had enjoyed Jarrod McKenna’s workshop about causing Christ-like trouble the day before, so I was excited about the word he would bring that night. I was not disappointed. As he introduced the concept of the “Dunker Punk,” my fear of leaving NYC unchanged dissipated. Jarrod reminded us that only eight brave people started our Brethren Dunker Punk movement more than 300 years ago, that they began a “Mustard Seed Revolution.” Then he called for eight more brave brothers and sisters to continue this radical love, and I was changed. For the first time all week I felt an overwhelming sense of call. When Jarrod asked for at least eight people to come and stand with him, to dedicate themselves to being Dunker Punks, I didn’t hesitate. In the mass of people flooding the stage, Aaron and I were side by side. After the service, we sat outside the arena while people bustled around us, getting psyched for the concert that was about to follow worship. “Do you think tomorrow all these people will remember that they stood?” Aaron asked. That question has consumed me ever since. Watching everyone laugh and scream as they made their way back into the arena for the concert, it was easy to think that maybe we wouldn’t remember. Maybe we would forget that we aligned ourselves to the renewal of our heritage of Christ-like love. Maybe we would get back home and everything would return to how it was before NYC. Maybe all of this would just be a great memory. But that hasn’t happened. With a Facebook page, Twitter handle, and website devoted to the Dunker Punk movement, our little Mustard Seed Revolution has already spread beyond Fort Collins and NYC. With those two tiny words we claimed a name and started something with big potential. With our lives that often feel small, we came together and realized our strength. It seems incredible to think about but, then again, we Brethren have always been called from small beginnings. Maddie Dulabaum was a youth participant and member of the news team at NYC this summer, and will begin college this fall. To read coverage from the conference, visit brethren.org/nyc . To support the Youth and Young Adult Ministries that are dedicated to creating experiences like NYC for Brethren young people, visit brethren.org/give .